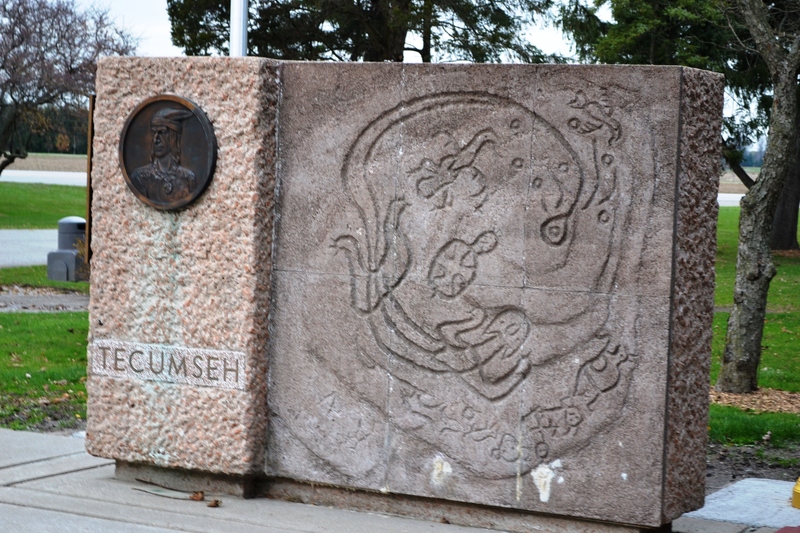 Tecumseh monument at Battle of Thames, Canada. I live in the neighborhood of great events. You probably do too. Among life’s little joys for me is a trip to find those events in the landscape; a thermos of hot coffee, my camera, a serious stack of maps, reference books, choice tunes on the hifi and a meander through the city streets and rural lanes of southeast Michigan, and sometimes a whole lot further. Revolutionary road trips have long been my favored way to spend my own time. Revolutionaries tends to take sides, and take sides historically as well. Leave ‘objectivity’ to the hegemons. A lot of what I look for are the things that appeal to the left-wing activist; sites of strikes, heroic last stands, scenes of eventful gatherings, graves of martyrs, old homes of radicals and the like. Signposts of resistance. It’s not just the sites I’m looking for, but also the landscapes they sit in. Those landscapes have been shaped by this, relatively recent, class society like everything else. From the brick and mortar of the historic home, to the layout of cities, to the course of rivers and vegetation, so many products of the laws of capitalist accumulation. However, they were built onto a landscape already made. 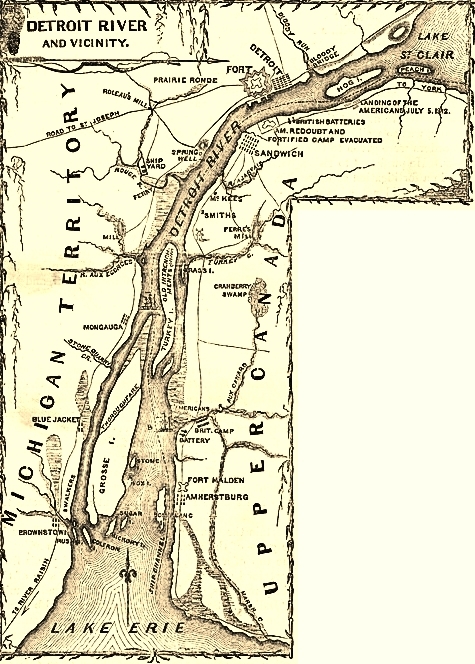 Where and when many of the villages and cities, roads and crossings of southeast Michigan were placed was entirely determined by prior actions of Indian peoples. Recently, I thought to look for something like the footsteps of the Shawnee leader Tecumseh, who fought in the area as a leader in a Confederacy of Indian peoples. A few weeks ago I decided to wind my way down from Ypsilanti to the mouth of the Huron River at Lake Erie. That river is one of those landscape features whose course has been altered by the expansion and needs of capital. A year-long obsession with the River’s, and region’s, late Indian history led me to try and follow, as close as possible, the river. The river has gone through many changes, most noticeably through the use of dams and mill races from the earliest white settlement. 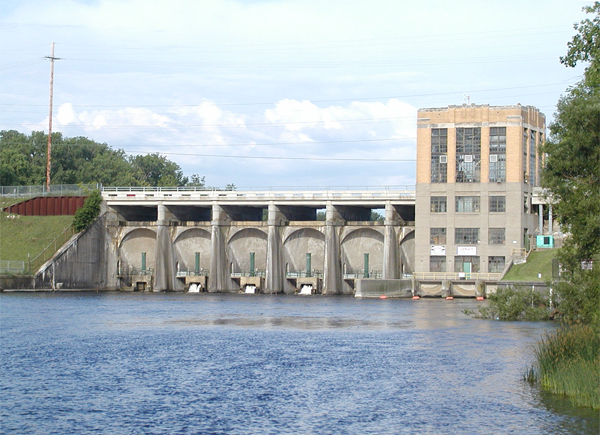 In his desire to control all the sources of power around him, Henry Ford bought up a huge portion of the Huron River for its potential water power. 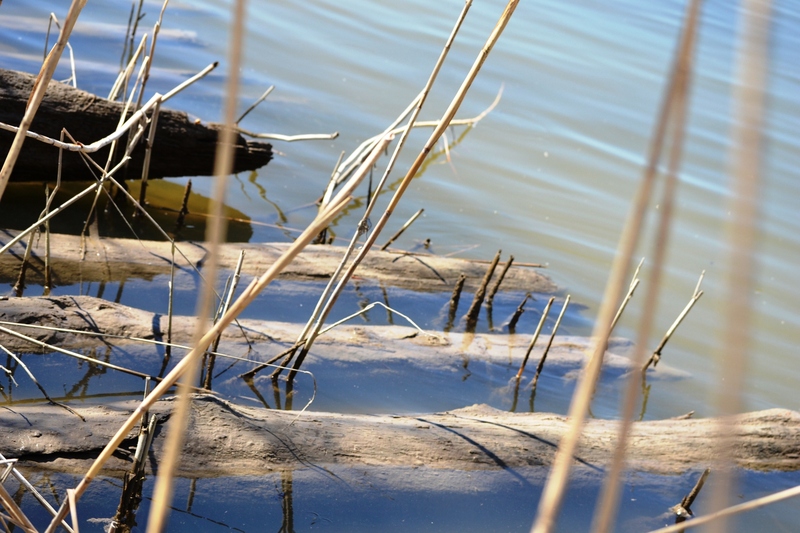 To get to Lake Erie by way of the river requires one to pass multiple dams and flooded zones (some of which buried the farming lands of the Potawatomi, the area’s last Indian inhabitants) until south of Belleville. 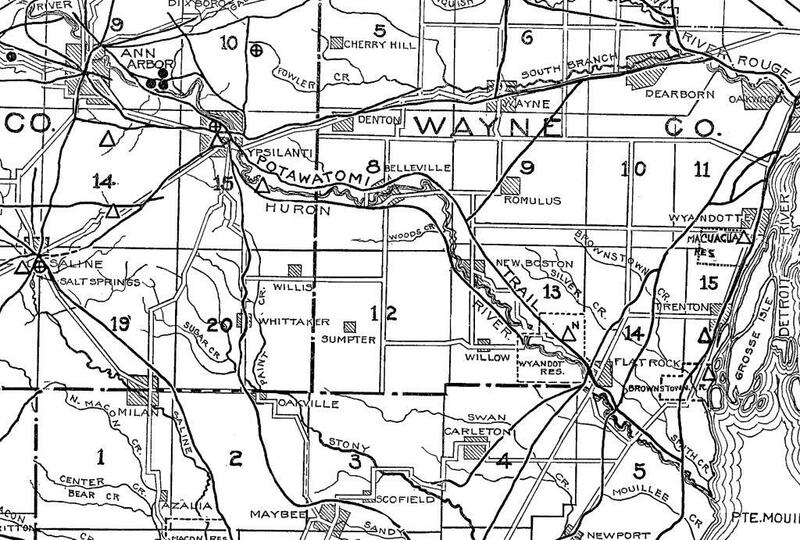 Relatively unaltered through miles of Metroparks, mostly reclaimed farmland, but some old industrial sites as well, the Huron flows past the old Wyandotte reservation north of Flat Rock. Perhaps I’ll write about that story in the future, it’s worthy of a post all its own. I ended up skirting the river and driving through the collection of subdivisions and soon to be divided farmsteads and fields, four-way stops of gas stations and strips of parking lots with shops attached. It was about here that I decided to put on the new Swans CD and listen to the 30 minute cacophony on Toussaint Louverture; an escape more than a provocation. The particular suburban landscape here isn’t really suburban at all (sub of what urban? ), but the kind of hodge-podge you get when the deciding factor on location is which old farm is up for auction and where the closest on ramp to a major road is. Ugly doesn’t begin to describe it. Oppressive might. That’s was not what I was looking for; my goal was Hull’s Trace, a historic road that lies under the current Jefferson Avenue for much of its length in this part of Michigan. 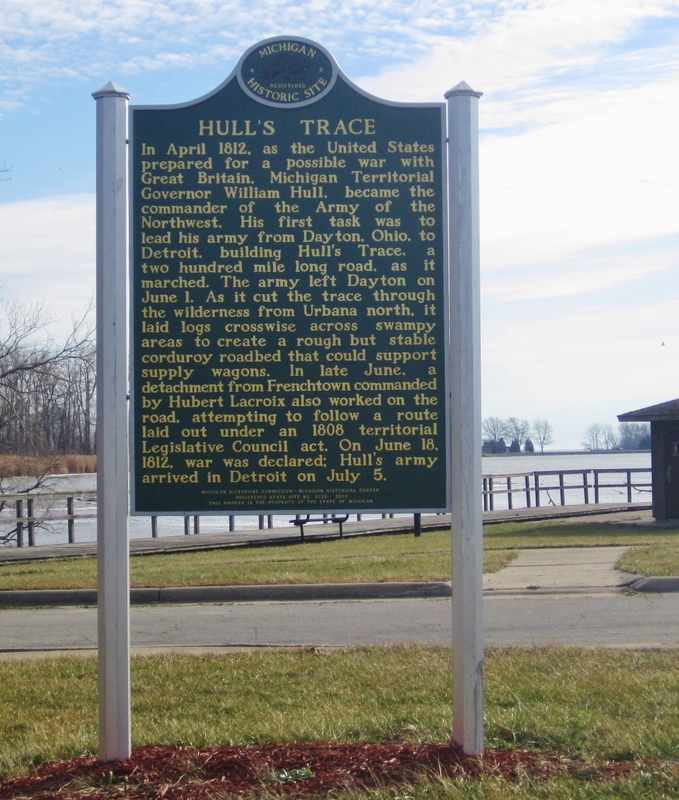 Hull’s Trace was named after General William Hull, who, during the War of 1812, was placed in charge of relieving Detroit and securing a supply line through what was then largely held by Indians allied with Tecumseh’s Confederacy. In a few short weeks in the summer of 1812, 200 US soldiers hacked their way from Urbana, Ohio to Fort Detroit in Michigan. 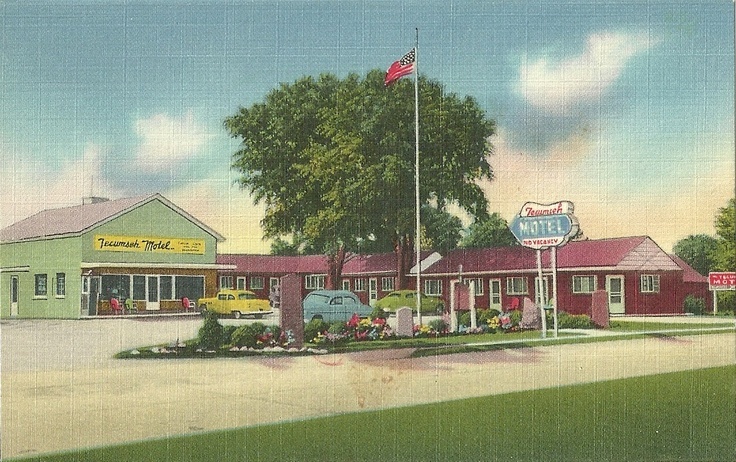 Growing up in Ohio, Tecumseh was unavoidable for a young person fascinated with history and I have visited many of the places associated with him, including the Tecumseh Motel, a rundown place that sits on the on the site of his birth village. Last year, a comrade and I drove to Canada, just after the bicentennial anniversary, to visit the site of Tecumseh’s final stand. There he fell, along with many others including Roundhead, after yet another British betrayal at the Battle of the Thames in October, 1813. An affectingly desolate place in late fall. Tecumseh’s forces were arrayed around Detroit and included warriors from a dozen nations, but to isolate Detroit they needed the support of the Wyandot villages along the Detroit River, and Hull’s Trace. Walk-in-the-Water, a head man in these villages, was convinced to join the Confederacy by Tecumseh and his leading Wyandot supporter, Roundhead. Detroit was cut-off. After a series of mostly successful battles by the Confederacy in the summer of 1812, US forces at Detroit surrendered to the combined Indian and British army on August 16. One needs to be reminded that, far from being rolled over, Native Americans won many spectacular victories, especially in the old Northwest, where two generations of resistance inflicted the greatest casualties on the US military by any Indian forces in history. I wanted to find where the road and villages were, then take Jefferson up to Detroit following the route of Hull’s Trace. 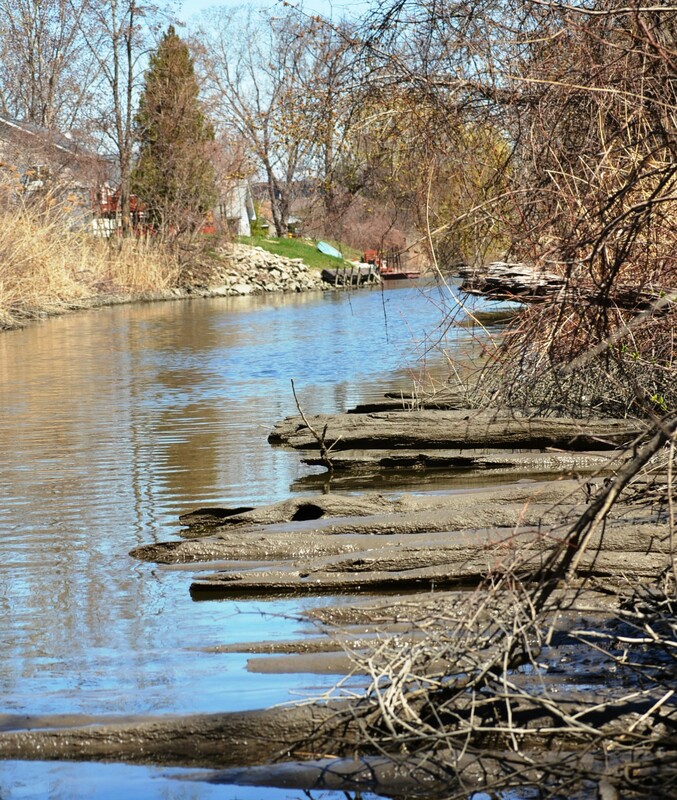 I had heard that a portion of the road, a corduroy section, had been exposed at the mouth of the Huron after the Great Lakes dropped a few feet in 2000. This area along the lake is mostly now protected parkland and small homes. The mouth of the Huron was long the home to various industries, but is now a place to put in for game fishing on Lake Erie. For nearly two hundred years the road has been built upon, with a successive set of transportation technologies imprinting their needs on the route. But just a few feet under concrete and the semi trucks racing their hauls to warehouses and factories lay the very road walked upon by Tecumseh, Roundhead, Main Poc and the hundreds of others who united and fought to regain Indian lands lost across the Appalachians and retain an independent Indian polity in the face of American genocide and conquest. When I found it, I ended up staying the whole afternoon until dusk, falling my way through the underbrush, soaking wet looking for anything and everything that might inform what I was seeing. 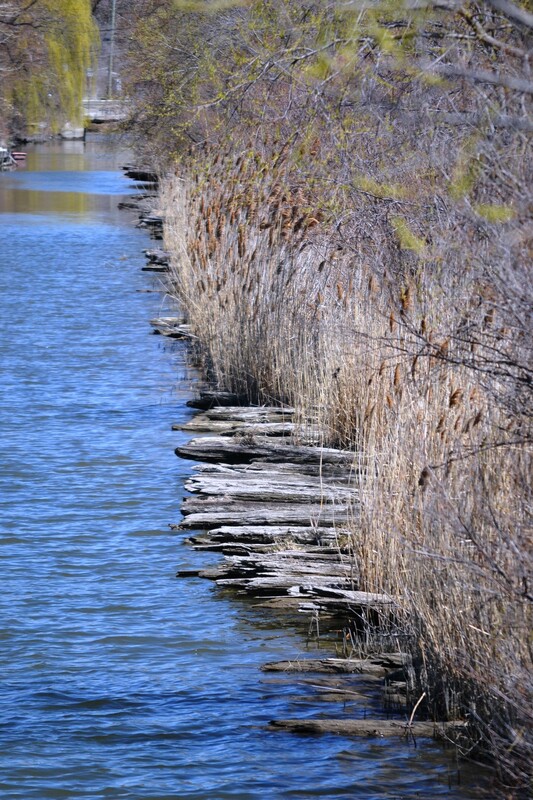 For hundreds of yards rows of hewn logs (this area along the Lake was swampland and it was necessary to lay logs down for the carts and soldiers to travel) jutted from the side of the road bed into a channel of the Huron River. The first thing I noticed was the size of some of the logs, clearly belonging to a very different forest than the one I was looking at. The parklands and reserves we take for granted as ‘natural’ would have been as alien in some ways as our cars and factories to peoples of two hundred years ago. Wood demands touch, especially worked wood, and I felt many of the logs as I hopped from dry spot to dry spot, sometimes successfully. Impossible not to think of the shoes that trod those logs, the armies that crossed them, the wares and ideas, messages and something like hope that Indian peoples brought with them that summer on this very wood, felled from the forest that some knew so intimately. Facing east there is no good sunset over this part of Lake Erie, just across from the remains of the road. But I ended up there on a cloudy and unremarkable dusk. A historic marker sits in a parking lot at the mouth and gives some information on the road. None of it captured what that road meant, for a moment in the summer of 1812, in the strategy, and hope, of the last collective Indian military resistance in the region. The defeat of which, the following year, would mean removal and the opening of the land to speculators and a flood of American settlers, and eventually the landscape we live in today, including the nearby Woodland Beach subdivision, which is neither. The struggle for Indian self-determination is hardly over, and despite all, the genocide ultimately failed. However, the independent Indian world that Tecumseh and the people who won this road sought to defend is no more. Took the long way home, back roads all the way and listened to the baseball game, wishing I could travel back in time with a knapsack full of ordinance strong enough to make a difference. Some folks place their hopes in imagined futures; I certainly have mine. But I place all of my fiercest wishes in imagined pasts. That in the militant state of the working class, its economic movement and its political action are indissolubly united. On the 20th anniversary of the Paris Commune, March 18, 1891. I did not anticipate that I would be asked to prepare a new edition of the Address of the General Council of the International on The Civil War in France, and to write an introduction to it. Therefore I can only touch briefly here on the most important points. I am prefacing the longer work mentioned above by the two shorter addresses of the General Council on the Franco-Prussian War. [Chapter 1 and Chapter 2] In the first place, because the second of these, which itself cannot be fully understood without the first, is referred to in The Civil War. But also because these two Addresses, likewise drafted by Marx, are, no less than The Civil War, outstanding examples of the author’s remarkable gift, first proved in The Eighteenth Brumaire of Louis Bonaparte, for grasping clearly the character, the import, and the necessary consequences of great historical events, at a time when these events are still in process before our eyes, or have only just taken place. And, finally, because we in Germany are still having to endure the consequences which Marx prophesied would follow from these events. Has that which was declared in the first Address not come to pass: that if Germany’s defensive war against Louis Bonaparte degenerated into a war of conquest against the French people, all the misfortunes which befell Germany after the so-called wars of liberation[B] would revive again with renewed intensity? Have we not had a further 20 years of Bismarck’s government, the Exceptional Law and the anti-socialist campaign taking the place of the prosecutions of demagogues,[C] with the same arbitrary police measures and with literally the same staggering interpretations of the law? And has not the prophecy been proved to the letter that the annexation of Alsace-Lorraine would “force France into the arms of Russia,” and that after this annexation Germany must either become the avowed tool of Russia, or must, after some short respite, arm for a new war, and, moreover, “a race war against the combined Slavonic and Roman races”? Has not the annexation of the French provinces driven France into the arms of Russia? Has not Bismarck for fully 20 years vainly wooed the favor of the tsar, wooed it with services even more lowly than those which little Prussia, before it became the “first power in Europe,” was wont to lay at Holy Russia’s feet? And is there not every day hanging over our heads the Damocles’ sword of war, on the first day of which all the chartered covenants of princes will be scattered like chaff; a war of which nothing is certain but the absolute uncertainty of its outcome; a race war which will subject the whole of Europe to devastation by 15 or 20 million armed men, and is only not already raging because even the strongest of the great military states shrinks before the absolute incalculability of its final outcome? All the more is it our duty to make again accessible to the German workers these brilliant proofs, now half-forgotten, of the far-sightedness of the international working class policy in 1870. What is true of these two Addresses is also true of The Civil War in France. On May 28, the last fighters of the Commune succumbed to superior forces on the slopes of Belleville; and only two days later, on May 30, Marx read to the General Council the work in which the historical significance of the Paris Commune is delineated in short powerful strokes, but with such clearness, and above all such truth, as has never again been attained on all the mass of literature which has been written on this subject. 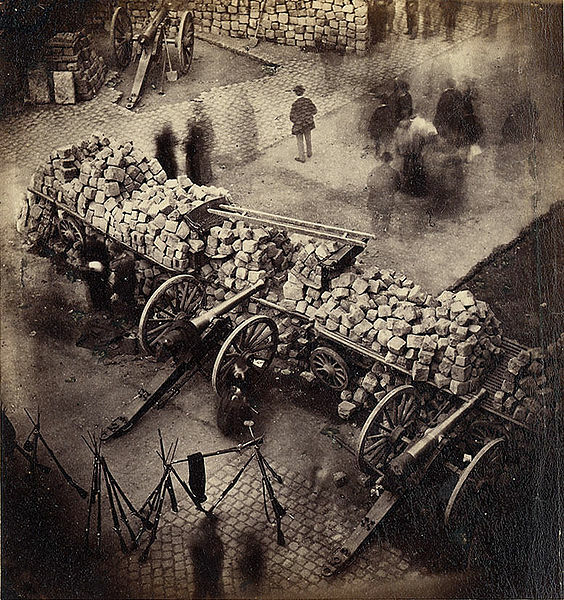 If today, we look back at the activity and historical significance of the Paris Commune of 1871, we shall find it necessary to make a few additions to the account given in The Civil War in France. The members of the Commune were divided into a majority of the Blanquists, who had also been predominant in the Central Committee of the National Guard; and a minority, members of the International Working Men’s Association, chiefly consisting of adherents of the Proudhon school of socialism. The great majority of the Blanquists at that time were socialist only by revolutionary and proletarian instinct; only a few had attained greater clarity on the essential principles, through Vaillant, who was familiar with German scientific socialism. It is therefore comprehensible that in the economic sphere much was left undone which, according to our view today, the Commune ought to have done. The hardest thing to understand is certainly the holy awe with which they remained standing respectfully outside the gates of the Bank of France. This was also a serious political mistake. The bank in the hands of the Commune – this would have been worth more than 10,000 hostages. It would have meant the pressure of the whole of the French bourgeoisie on the Versailles government in favor of peace with the Commune, but what is still more wonderful is the correctness of so much that was actually done by the Commune, composed as it was of Blanquists and Proudhonists. Naturally, the Proudhonists were chiefly responsible for the economic decrees of the Commune, both for their praiseworthy and their unpraiseworthy aspects; as the Blanquists were for its political actions and omissions. And in both cases the irony of history willed – as is usual when doctrinaires come to the helm – that both did the opposite of what the doctrines of their school proscribed. By 1871, even in Paris, the centre of handicrafts, large-scale industry had already so much ceased to be an exceptional case that by far the most important decree of the Commune instituted an organization of large-scale industry and even of manufacture which was not based only on the association of workers in each factory, but also aimed at combining all these associations in one great union; in short an organization which, as Marx quite rightly says in The Civil War, must necessarily have led in the end to communism, that is to say, the direct antithesis of the Proudhon doctrine. And, therefore, the Commune was also the grave of the Proudhon school of socialism. Today this school has vanished from French working class circles; among them now, among the Possibilists no less than among the “Marxists”, Marx’s theory rules unchallenged. Only among the “radical” bourgeoisie are there still Proudhonists. The Blanquists fared no better. Brought up in the school of conspiracy, and held together by the strict discipline which went with it, they started out from the viewpoint that a relatively small number of resolute, well-organized men would be able, at a given favorable moment, not only seize the helm of state, but also by energetic and relentless action, to keep power until they succeeded in drawing the mass of the people into the revolution and ranging them round the small band of leaders. this conception involved, above all, the strictest dictatorship and centralization of all power in the hands of the new revolutionary government. And what did the Commune, with its majority of these same Blanquists, actually do? In all its proclamations to the French in the provinces, it appealed to them to form a free federation of all French Communes with Paris, a national organization, which for the first time was really to be created by the nation itself. It was precisely the oppressing power of the former centralized government, army, political police and bureaucracy, which Napoleon had created in 1798 and since then had been taken over by every new government as a welcome instrument and used against its opponents, it was precisely this power which was to fall everywhere, just as it had already fallen in Paris. From the outset the Commune was compelled to recognize that the working class, once come to power, could not manage with the old state machine; that in order not to lose again its only just conquered supremacy, this working class must, on the one hand, do away with all the old repressive machinery previously used against it itself, and, on the other, safeguard itself against its own deputies and officials, by declaring them all, without exception, subject to recall at any moment. What had been the characteristic attribute of the former state? Society had created its own organs to look after its common interests, originally through simple division of labor. But these organs, at whose head was the state power, had in the course of time, in pursuance of their own special interests, transformed themselves from the servants of society into the masters of society, as can be seen, for example, not only in the hereditary monarchy, but equally also in the democratic republic. Nowhere do “politicians” form a more separate, powerful section of the nation than in North America. There, each of the two great parties which alternately succeed each other in power is itself in turn controlled by people who make a business of politics, who speculate on seats in the legislative assemblies of the Union as well as of the separate states, or who make a living by carrying on agitation for their party and on its victory are rewarded with positions. It is well known that the Americans have been striving for 30 years to shake off this yoke, which has become intolerable, and that in spite of all they can do they continue to sink ever deeper in this swamp of corruption. It is precisely in America that we see best how there takes place this process of the state power making itself independent in relation to society, whose mere instrument it was originally intended to be. Here there exists no dynasty, no nobility, no standing army, beyond the few men keeping watch on the Indians, no bureaucracy with permanent posts or the right to pensions. and nevertheless we find here two great gangs of political speculators, who alternately take possession of the state power and exploit it by the most corrupt means and for the most corrupt ends – and the nation is powerless against these two great cartels of politicians, who are ostensibly its servants, but in reality exploit and plunder it. Against this transformation of the state and the organs of the state from servants of society into masters of society – an inevitable transformation in all previous states – the Commune made use of two infallible expedients. In this first place, it filled all posts – administrative, judicial, and educational – by election on the basis of universal suffrage of all concerned, with the right of the same electors to recall their delegate at any time. And in the second place, all officials, high or low, were paid only the wages received by other workers. The highest salary paid by the Commune to anyone was 6,000 francs. In this way an effective barrier to place-hunting and careerism was set up, even apart from the binding mandates to delegates to representative bodies which were also added in profusion. This shattering of the former state power and its replacement by a new and really democratic state is described in detail in the third section of The Civil War. But it was necessary to dwell briefly here once more on some of its features, because in Germany particularly the superstitious belief in the state has been carried over from philosophy into the general consciousness of the bourgeoisie and even to many workers. According to the philosophical notion, “the state is the realization of the idea” or the Kingdom of God on earth, translated into philosophical terms, the sphere in which eternal truth and justice is or should be realized. And from this follows a superstitious reverence for the state and everything connected with it, which takes roots the more readily as people from their childhood are accustomed to imagine that the affairs and interests common to the whole of society could not be looked after otherwise than as they have been looked after in the past, that is, through the state and its well-paid officials. And people think they have taken quite an extraordinary bold step forward when they have rid themselves of belief in hereditary monarchy and swear by the democratic republic. In reality, however, the state is nothing but a machine for the oppression of one class by another, and indeed in the democratic republic no less than in the monarchy; and at best an evil inherited by the proletariat after its victorious struggle for class supremacy, whose worst sides the proletariat, just like the Commune, cannot avoid having to lop off at the earliest possible moment, until such time as a new generation, reared in new and free social conditions, will be able to throw the entire lumber of the state on the scrap-heap. Of late, the Social-Democratic philistine has once more been filled with wholesome terror at the words: Dictatorship of the Proletariat. Well and good, gentlemen, do you want to know what this dictatorship looks like? Look at the Paris Commune. That was the Dictatorship of the Proletariat. Socialists are always accused of trying to create ill feeling, to bring about a class struggle, to “set class against class”. Of course, the real fact is, we only point out what already exists, analysing the political and industrial institutions under which we live and critically noting the forces which produce them in any given phase. The necessary result of our analysis is to discover that the very basis of Society today is a struggle between two classes, the Landlord and Capitalist who own all the means of production, and the propertyless class who are only allowed to use and operate these means of life when it suits the convenience or interest of members of the other class to allow them. The average worker has no clear, reasoned out knowledge of this, but he has a more or less dim perception of the fact borne in upon his slow intellect through the channel of his daily experience of the struggle for life. His masters who are interested in keeping him in that plentiful lack of knowledge are always careful to raise the cry “Capital and labour are brothers” and don’t “set class against class”. Armed thus, mentally, with the illogical rot preached to him by his fleecers the “man in the street” regards the Socialist as, well – perhaps right enough, but rather “extreme”. We Socialist workers who know the tricks by which our fellows are deceived and kept in subjection are filled with disgust, mingled with pity. But the Socialist is so extreme. He sets class against class. But the Socialist is so extreme. He talks of capitalist government. James Connolly. The Workers’ Republic, May 1901. This talk, excerpted below was given by James Cannon to a west coast educational of the Socialist Workers Party in 1957 in the aftermath of McCarthyism and the Blacklist, during the explosion of the Civil Rights movement in the south and the height of the power of the Soviet Union, of the Stalinist negation of workers democracy . I’ve never particularly identified myself with the Cannon wing of American Trotskyism, yet I have a profound appreciation of Cannon. He was an authentic American revolutionary and was at his considerable best when explaining the deep truths of capitalist society and of the class struggle in that particular Kansas vernacular of his. We are now witnessing, as part of the Occupy movement, a mass yearning for a democracy that is real in foks lives. And this yearning is being practiced, not without difficulty, in the hundreds of assemblies now gathered in towns across the country. People want power over their own lives and a say in their future and their present as well as that of their community. The egalitarian spirit is more apart of what makes us human than the competition capitalist society celebrates and fosters; every generation since the advent of social division in human society has seen, in some way, a rebellion against it. Even now, in the most powerful ‘democracy’ the world has ever known a democratic rebellion brews. The full text of Cannon’s speech can be found here. Comrades, I am glad to be here with you today, and to accept your invitation to speak on socialism and democracy. It is a most timely subject, and in the discussion of socialist regroupment it takes first place. Before we can make real headway in the discussion of other important parts of the program, we have to find agreement on what we mean by socialism and what we mean by democracy, and how they are related to each other, and what we are going to say to the American workers about them. Strange as it may seem, an agreement on these two simple, elementary points, as experience has already demonstrated, will not be arrived at easily. The confusion and demoralisation created by Stalinism, and the successful exploitation of this confusion by the ruling capitalists of this country and all their agents and apologists, still hang heavily over all sections of the workers’ movement. We have to recognise that. Even in the ranks of people who call themselves socialists, we encounter a wide variety of understandings and misunderstandings about the real meaning of those simple terms, socialism and democracy. And in the great ranks of the American working class, the fog of misunderstanding and confusion is even thicker. All this makes the clarification of these questions a problem of burning importance and immediacy. In fact, it is first on the agenda in all circles of the radical movement. The widespread misunderstanding and confusion about socialism and democracy has profound causes. These causes must be frankly stated and examined before they can be removed. And we must undertake to remove them, if we are to try in earnest to get to the root of the problem. Shakespeare’s Marc Antony reminded us that evil quite often outlives its authors. That is true in the present case also. Stalin is dead; but the crippling influence of Stalinism on the minds of a whole generation of people who considered themselves socialists or communists lives after Stalin. This is testified to most eloquently by those members and fellow travellers of the Communist Party who have formally disavowed Stalinism since the Twentieth Congress, while retaining some of its most perverted conceptions and definitions. Socialism, in the old days that I can recall, was often called the society of the free and equal, and democracy was defined as the rule of the people. These simple definitions still ring true to me, as they did when I first heard them many years ago. But in later years we have heard different definitions which are far less attractive. These same people whom I have mentioned —leaders of the Communist Party and fellow travellers who have sworn off Stalin without really changing any of the Stalinist ideas they assimilated—still blandly describe the state of affairs in the Soviet Union, with all its most exaggerated social and economic inequality, ruled over by the barbarous dictatorship of a privileged minority, as a form of “socialism”. And they still manage to say, with straight faces, that the hideous police regimes in the satellite countries, propped up by Russian military force, are some kind of “people’s democracies”. When such people say it would be a fine idea for all of us to get together in the struggle for socialism and democracy, it seems to me it would be appropriate to ask them, by way of preliminary inquiry: “Just what do you mean by socialism, and what do you mean by democracy? Do you mean what Marx and Engels and Lenin said? Or do you mean what Stalin did?” They are not the same thing as can be easily proved, and it is necessary to choose between one set of definitions and the other. There is no doubt that this drumfire of bourgeois propaganda, supplemented by the universal revulsion against Stalinism, has profoundly affected the sentiments of the American working class, including the bulk of its most progressive and militant and potentially revolutionary sectors. After all that has happened in the past quarter of a century, the American workers have become more acutely sensitive than ever before to the value and importance of democratic rights. That, in my opinion, is the progressive side of their reaction, which we should fully share. The horrors of fascism, as they were revealed in the ’30s, and which were never dreamed of by the socialists in the old days, and the no less monstrous crimes of Stalinism, which became public knowledge later—all this has inspired a fear and hatred of any kind of dictatorship in the minds of the American working class. And to the extent that the Stalinist dictatorship in Russia has been identified with the name of socialism, and that this identification has been taken as a matter of course, the American workers have been prejudiced against socialism. That’s the bitter truth, and it must be looked straight in the face. This barrier to the expansion and development of the American socialist movement will not be overcome, and even a regroupment of the woefully limited forces of those who at present consider themselves socialists will yield but little fruit, unless and until we find a way to break down this misunderstanding and prejudice against socialism, and convince at least the more advanced American workers that we socialists are the most aggressive and consistent advocates of democracy in all fields and that, in fact, we are completely devoted to the idea that socialism cannot be realised otherwise than by democracy. The socialist movement in America will not advance again significantly until it regains the initiative and takes the offensive against capitalism and all its agents in the labour movement precisely on the issue of democracy. What is needed is not a propaganda device or trick, but a formulation of the issue as it really stands; and, indeed, as it has always stood with real socialists ever since the modern movement was first proclaimed 109 years ago. For this counteroffensive against bourgeois propaganda we do not need to look for new formulations. Our task, as socialists living and fighting in this day and hour, is simply to restate what socialism and democracy meant to the founders of our movement, and to all the authentic disciples who followed them; to bring their formulations up to date and apply them to present conditions in the United States. All previous historical movements were movements of minorities, or in the interest of minorities. The proletarian movement is the self-conscious, independent movement of the immense majority, in the interest of the immense majority. The authors of the Communist Manifesto linked socialism and democracy together as end and means. The “self-conscious, independent movement of the immense majority, in the interest of the immense majority” cannot be anything else but democratic, if we understand by “democracy” the rule of the people, the majority. The Stalinist claim—that the task of reconstructing society on a socialist basis can be farmed out to a privileged and uncontrolled bureaucracy, while the workers remain without voice or vote in the process—is just as foreign to the thoughts of Marx and Engels, and of all their true disciples, as the reformist idea that socialism can be handed down to the workers by degrees by the capitalists who exploit them. All such fantastic conceptions were answered in advance by the reiterated statement of Marx and Engels that “the emancipation of the working class is the task of the workers themselves”. That is the language of Marx and Engels—“the task of the workers themselves”. That was just another way of saying—as they said explicitly many times—that the socialist reorganisation of society requires a workers’ revolution. Such a revolution is unthinkable without the active participation of the majority of the working class, which is itself the big majority of the population. Nothing could be more democratic than that. That is the way Marx and Engels formulated the first aim of the revolution—to make the workers the ruling class, to establish democracy, which, in their view, is the same thing. From this precise formulation it is clear that Marx and Engels did not consider the limited, formal democracy under capitalism, which screens the exploitation and the rule of the great majority by the few, as real democracy. In order to have real democracy, the workers must become the “ruling class”. Only the revolution that replaces the class rule of the capitalists by the class rule of the workers can really establish democracy, not in fiction, but in fact. So said Marx and Engels. They never taught that the simple nationalisation of the forces of production signified the establishment of socialism. That’s not stated by Marx and Engels anywhere. Nationalisation only lays the economic foundations for the transition to socialism. Still less could they have sanctioned, even if they had been able to imagine, the monstrous idea that socialism could be realised without freedom and without equality; that nationalised production and planned economy, controlled by a ruthless police dictatorship, complete with prisons, torture chambers and forced-labour camps, could be designated as a “socialist” society. That unspeakable perversion and contradiction of terms belongs to the Stalinists and their apologists. All the great Marxists defined socialism as a classless society—with abundance, freedom and equality for all; a society in which there would be no state, not even a democratic workers’ state, to say nothing of a state in the monstrous form of a bureaucratic dictatorship of a privileged minority. Trotsky said the same thing in other words when he spoke of socialism as “a pure and limpid social system which is accommodated to the self-government of the toilers … and uninterrupted growth of universal equality—all-sided flowering of human personality … unselfish, honest and human relations between human beings”. The bloody abomination of Stalinism cannot be passed off as a substitute for this picture of the socialist future and the democratic transition period leading up to it, as it was drawn by the great Marxists. And I say we will not put the socialist movement of this country on the right track and restore its rightful appeal to the best sentiments of the working class of this country and above all to the young, until we begin to call socialism by its right name as the great teachers did. Until we make it clear that we stand for an ever-expanding workers’ democracy as the only road to socialism. Until we root out every vestige of Stalinist perversion and corruption of the meaning of socialism and democracy, and restate the thoughts and formulations of the authentic Marxist teachers. But the Stalinist definitions of socialism and democracy are not the only perversions that have to be rejected before we can find a sound basis for the regroupment of socialist forces in the United States. The definitions of the social democrats of all hues and gradations are just as false. And in this country they are a still more formidable obstacle because they have deeper roots, and they are tolerantly nourished by the ruling class itself. The liberals, the social democrats and the bureaucratic bosses of the American trade unions are red-hot supporters of “democracy”. At least, that is what they say. And they strive to herd the workers into the imperialist war camp under the general slogan of “democracy versus dictatorship”. That is their slippery and consciously deceptive substitute for the real “irrepressible conflict” of our age, the conflict between capitalism and socialism. They speak of democracy as something that stands by itself above the classes and the class struggle, and not as the form of rule of one class over another. Capitalism, under any kind of government—whether bourgeois democracy or fascism or a military police state—under any kind of government, capitalism is a system of minority rule, and the principal beneficiaries of capitalist democracy are the small minority of exploiting capitalists; scarcely less so than the slaveowners of ancient times were the actual rulers and the real beneficiaries of the Athenian democracy. To be sure, the workers in the United States have a right to vote periodically for one of two sets of candidates selected for them by the two capitalist parties. And if they can dodge the witch-hunters, they can exercise the right of free speech and free press. But this formal right of free speech and free press is outweighed rather heavily by the inconvenient circumstance that the small capitalist minority happens to enjoy a complete monopoly of ownership and control of all the big presses, and of television and radio, and of all other means of communication and information. We who oppose the capitalist regime have a right to nominate our own candidates, if we’re not arrested under the Smith Act before we get to the city clerk’s office, and if we can comply with the laws that deliberately restrict the rights of minority parties. That is easier said than done in this country of democratic capitalism. In one state after another, no matter how many petitions you circulate, you can’t comply with the regulations and you can’t get on the ballot. This is the state of affairs in California, Ohio, Illinois, and an increasing number of other states. And if you succeed in complying with all the technicalities, as we did last year in New York, they just simply rule you out anyhow if it is not convenient to have a minority party on the ballot. But outside of all these and other difficulties and restrictions, we have free elections and full democracy. But even so, with all that, a little democracy is better than none. We socialists have never denied that. And after the experiences of fascism and McCarthyism, and of military and police dictatorships in many parts of the world, and of the horrors of Stalinism, we have all the more reason to value every democratic provision for the protection of human rights and human dignity; to fight for more democracy, not less. Socialists should not argue with the American worker when he says he wants democracy and doesn’t want to be ruled by a dictatorship. Rather, we should recognise that his demand for human rights and democratic guarantees, now and in the future, is in itself progressive. The socialist task is not to deny democracy, but to expand it and make it more complete. That is the true socialist tradition. The Marxists, throughout the century-long history of our movement, have always valued and defended bourgeois democratic rights, restricted as they were; and have utilised them for the education and organisation of the workers in the struggle to establish full democracy by abolishing the capitalist rule altogether. The right of union organisation is a precious right, a democratic right, but it was not “given” to the workers in the United States. It took the mighty and irresistible labour upheaval of the ’30s, culminating in the great sit-down strikes—a semi-revolution of the American workers—to establish in reality the right of union organisation in mass-production industry. In the old days, the agitators of the Socialist Party and the IWW—who were real democrats—used to give a shorthand definition of socialism as “industrial democracy”. I don’t know how many of you have heard that. It was a common expression: “industrial democracy”, the extension of democracy to industry, the democratic control of industry by the workers themselves, with private ownership eliminated. That socialist demand for real democracy was taken for granted in the time of Debs and Haywood, when the American socialist movement was still young and uncorrupted. You never hear a “democratic” labour leader say anything like that today. The defence of “democracy” by the social democrats and the labour bureaucrats always turns out in practice to be a defence of “democratic” capitalism, or as Beck and McDonald call it, “people’s capitalism”. And I admit they have a certain stake in it, and a certain justification for defending it, as far as their personal interests are concerned. And always, in time of crisis, these labour leaders—who talk about democracy all the time, as against dictatorship in the “socialist countries”, as they call them—easily excuse and defend all kinds of violations of even this limited bourgeois democracy. They are far more tolerant of lapses from the formal rules of democracy by the capitalists than by the workers. They demand that the class struggle of the workers against the exploiters be conducted by the formal rules of bourgeois democracy, at all stages of its development—up to and including the stage of social transformation and the defence of the new society against attempts at capitalist restoration. They say it has to be strictly “democratic” all the way. No emergency measures are tolerated; everything must be strictly and formally democratic according to the rules laid down by the capitalist minority. They burn incense to democracy as an immutable principle, an abstraction standing above the social antagonisms. But when the capitalist class, in its struggle for self-preservation, cuts corners around its own professed democratic principles, the liberals, the social democrats and the labour skates have a way of winking, or looking the other way, or finding excuses for it. But in the class struggle of the workers against the capitalists to transform society, which is the fiercest war of all, and in the transition period after the victory of the workers, the professional democrats demand that the formal rules of bourgeois democracy, as defined by the minority of exploiters, be scrupulously observed at every step. No emergency measures are allowed. By these different responses in different situations of a class nature, the professional democrats simply show that their class bias determines their judgment in each case, and show at the same time that their professed devotion to the rules of formal democracy, at all times and under all conditions, is a fraud. In the United States, the struggle for workers’ democracy is preeminently a struggle of the rank and file to gain democratic control of their own organisations. That is the necessary condition to prepare the final struggle to abolish capitalism and “establish democracy” in the country as a whole. No party in this country has a right to call itself socialist unless it stands foursquare for the rank-and-file workers of the United States against the bureaucrats. In my opinion, effective and principled regroupment of socialist forces requires full agreement on these two points. That is the necessary starting point. Capitalism does not survive as a social system by its own strength, but by its influence within the workers’ movement, reflected and expressed by the labour aristocracy and the bureaucracy. So the fight for workers’ democracy is inseparable from the fight for socialism, and is the condition for its victory. Workers’ democracy is the only road to socialism, here in the United States and everywhere else, all the way from Moscow to Los Angeles, and from here to Budapest. A comrade recently arrived at my house from out east with a 500 page Soviet-produced pictorial biography of Frederick Engels as a gift (this comrade knows me well). Along with cartoons drawn by a young Engels, facsimiles of old newspapers and photos of the General are numerous small portraits of nineteenth century fellow travelers, many of them totally unknown to me. This year, 2011, has been compared to 1848 (comparisons are fine, as an analogy I think its doesn’t work). Countless thousands of revolutionaries have made their mark on the history of this planet since the revolutions of 1848 (a pretty good, if insufficient, marker denoting the modern revolutionary world). A few, very few, have names that are familiar to us revolutionaries today, most do not. As an avid reader of the letters of Marx and Engels (those volumes of the Werks being my choice company on the proverbial desert island), I am constantly coming across the names of folks now forgotten, but who deserve to be remembered. Some of them are the target of a rebuke, private or public, from Marx or Engels. Many of them are held in esteem for past revolutionary activities. All of them played some role in the founding modern movements of our struggle and our tradition. One of the joys of the Marx/Engels Collected Works are the footnotes and biographical appendices. One can begin reading a particular letter, say on German exile politics in the United States, only to find oneself knee-deep in the story of Arab mathematics or theories of rent or exile gossip or the latest scientific discovery or Greek history or the poems of Heinrich Heine. Wherever the words take you vistas not seen before await. 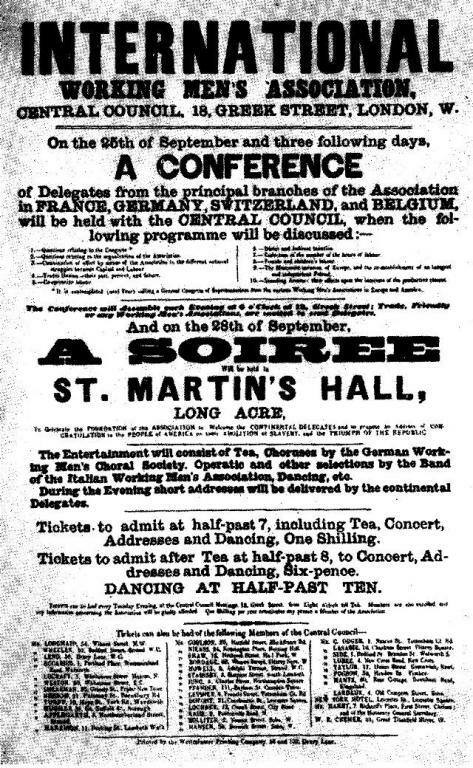 A little imagination and you’re back to September, 1864 in St. Martin’s Hall and trying to pick out the founding delegates of the International as they walk through the door or at an early meeting of the Communist League sitting through an August Willich harangue. For anyone who has spent time in the left these characters will be recognizable in one way or another; the revolutionary temperament common to many eras and epochs. The life struggles of individuals as common then as now; some were heroic, some fumbled around in confusion, some heroically fumbled. Some were inconsistent as revolutionaries through life, some lost or found their consistency along the way. All played a part. Here then are just a few half-forgotten names, but giants of their times. German revolutionaries, internationalists, Red Forty-Eighters, friends and confidants to Marx and Engels who shared their most formative years with them. Weerth was described by Engels as: ‘the German proletariat’s first and most important poet.’ After Weerth’s death, Marx and Engels collected his literary works, later Engels championed Weerth’s poems promoting them in the German Social-Democratic press for a new generation in the 1880s and 90s. Nearly lost to history now, his poems, journalism and satire were extremely important to the generation of ’48. Said by some to presage Brecht, he went to school with Christian Dietrich Grabbe and Ferdinand Freiligrath, two other important poets of the period. In Frankfurt we did stay. In that city we did stay. That’s none of your concern. We all of us took fright. The bed-bugs kept on biting. And who did suffer there. Weerth’s writing lapsed with his exile and the retreat of revolution in the early 1850s. He wrote to Marx thus: ‘I must admit that, just as I regret that I have lost the last three years for nothing, surely for nothing, it delights me when I remember our life in Cologne. We did not compromise ourselves! That is the most important thing.‘ He died in Havana about which he wrote to fellow poet Heinrich Heine that Cuba ‘would be the field where the great conflicts of the new world would be fought out first.’ Over a century later, and after the Cuban revolution, a plaque was laid in Havana to celebrate Weerth’s life. Karl Schapper was an instrumental actor in the forerunners of the Communist League. Born to a member of the clergy Schapper would go on to participate in all of the upheavals of his day including the Frankfurter Landsturm of 1832, Mazzini’s “Young Italy” invasion of the Savoy in 1834, the founding of the League of the Just, the 1839 Paris insurrection, the Chartist movement in England, the founding of the Communist League, the German Revolutions of 1848, a bitter split and then reconciliation with Marx and then the founding of the First International where he was elected to the General Council. Born into an impoverished family in Cologne, Moll trained to be a watchmaker. Traveling for his trade he joined the ‘Young Germany’ society of exiles in Switzerland in 1834, soon expelled he found himself in Paris where he joined the League of the Just and participated in the 1839 Blaquist ‘Society of Seasons’ insurrection. After that failed uprising Moll fled to London (the refuge of so many continental revolutionaries) where he helped found the German Workers Educational Society. He would go on to become a leading member of the League of the Just under the leadership of Wilhelm Weitling and as it was reorganized into the Communist League under the leadership of Karl Marx. Joseph returned to Germany with the outbreak of revolution in 1848 where he became president of the Workers’ Society and an early propagator of scientific socialism, of ‘Marxism’. Fleeing from arrest he returned to London only to find himself once again in Germany where he fought in the Baden uprising (as did Engels). Born to a family of carpenters in in 1809, Johann trained to be a brushmaker and became involved in the revolutionary movement in the early 1830s; suffering prison, organizing jail breaks, armed actions and revolutionary propaganda. Exiled in Switzerland he became a cigar-maker and took part in the Swiss Civil War of 1847. Becker would play a leading role in the revolutions in Germany in 1848-9, becoming Commander in Chief of the Baden People’s Army. He would go on to be a leading socialist in the Switzerland of his exile, organizing for a republican invasion of Italy in 1860, a founding member of the First International where he became President of the German speaking sections, founder of the Swiss Workers Party and the German Social Democrats and publisher of a number of important socialist journals. His entire life was served as a militant partisan of the working class. Affectionately called ‘Lupus’ by the Marx/Engels circle, Wolff was born in Silesia in eastern Germany and became active in politics as a student in the early 1830s. He would go on to become a member of Marx’s Brussels based Communist Correspondence Committee as well as the League of the Just. A founding member of the Communist League Wolff would become an editor of Neue Rheinische Zeitung during the German Revolutions of 1848-9 during which he was elected to the Frankfort Assembly. Like so many others, Wolff found himself exiled to England in the reaction following the ebbing of the revolutionary tide, a tide he swam against remaining committed to the working class cause until the end. He found work as a school teacher in Manchester, joining Engels. One who came a generation before (and whose politics showed that generational gap) was Heinrich Heine. Heine would, for a time, be a fellow traveler of the Marx family. His work certainly influenced all of these men, perhaps Marx most of all. A rebellion of weavers in Silesia in 1844 inspired Heine to write this poem. Later translated into English by Engels himself the poem was first published in Marx’s Vorwärts, it captures the moment and speaks to us still.